As the professional indemnity insurer for Ontario lawyers, LAWPRO enjoys a unique perspective on the practice of law. From where we stand, a successful career is measured not only by revenue or by the effectiveness of the solutions lawyers craft for their clients, but also from practising safely. To support that goal, the practicePRO department has created a range of publications designed to communicate practical advice to help avoid practice risks as we see them reflected in claims. 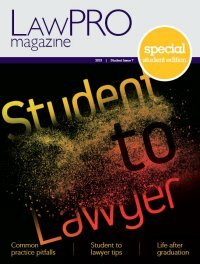 LAWPRO Magazine and our e-newsletters – LAWPRO Alert and LAWPRO Webzine – have earned the trust of a generation of lawyers looking for insights and practical tips for managing practice risk. LAWPRO Magazine: This quarterly publication contains information on the LAWPRO insurance program as well as current risk and practice management information. LAWPRO Webzine: Email newsletters with content focused on a specific area of law or topic. LAWPRO Reminder: Reminders about insurance program renewal and filing deadlines. LAWPRO Alert: Urgent messages or warnings requiring immediate attention such as an active fraud targeting Ontario lawyers. @LAWPRO, @practicePRO, @TitlePLUSCanada: Follow us on Twitter for regular updates and warnings.